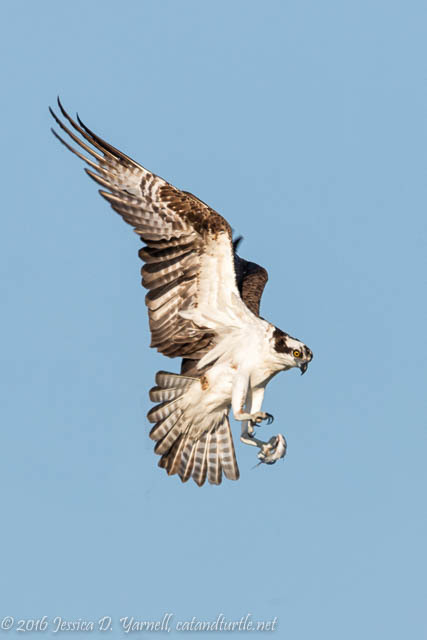 My dad loves to tease me that I only photograph Ospreys if they have fish in their mouth. While that’s not exactly true, a fish is definitely a good bonus! This one had just snagged a small breakfast from the lake. Some of his friends had much bigger catches. 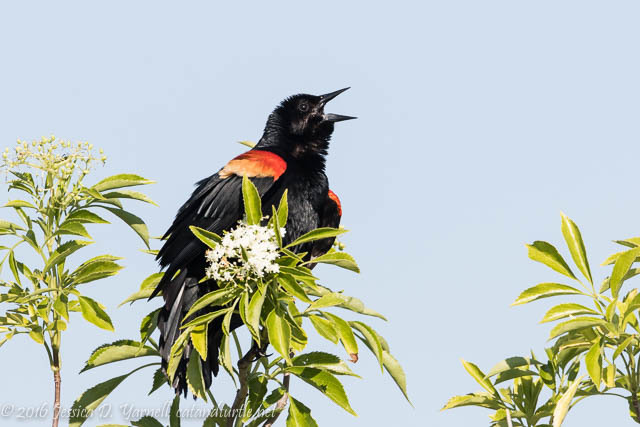 The wildlife drive was just covered in Red-winged Blackbirds. Every time I stopped the car, there was another male sitting in the top of a bush, singing. Along the side of the road, males and females hopped on the ground. 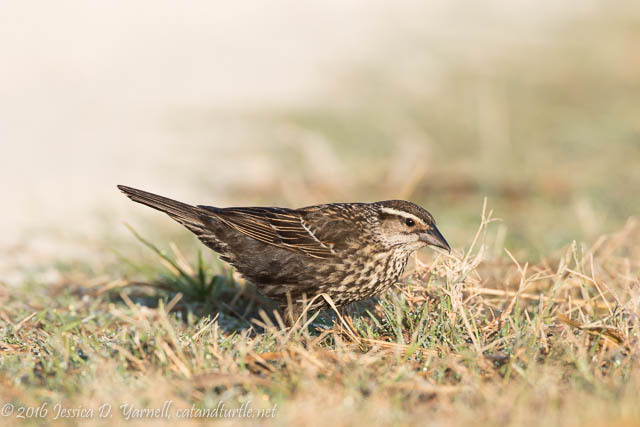 I was enjoying the early morning light, and I hopped out of the car and sat down to photograph one of the females. I could almost hear the thoughts of other birders as they drove by… “gosh, she has a really fancy camera and she’s taking pictures of a blackbird!?! ?” Yep! Why not? 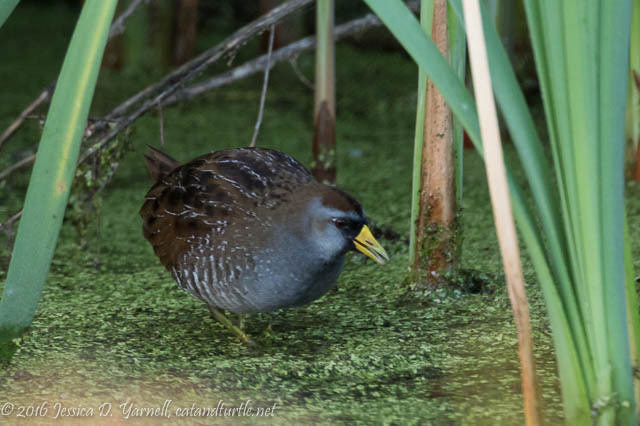 As I pulled into the wildlife drive, there was a Sora fully visible in between some reeds. These are usually pretty secretive birds, not often out in the open like this. I got out to get some closer shots, and the bird disappeared. 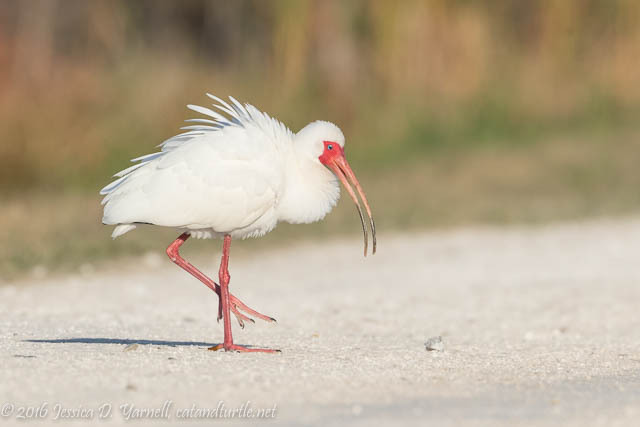 I saw a few juvenile White Ibises (with their brown spots), and then this one still in partial breeding plumage flew in. His bright red face and legs are quite distinctive. But he never did tell me why he decided to cross the road! 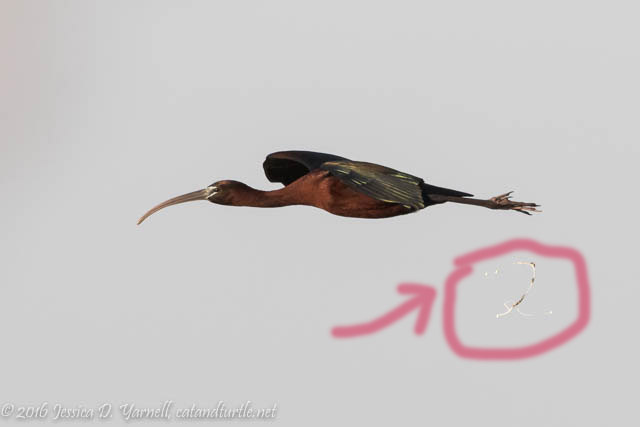 I saw several Glossy Ibises also, still in their breeding colors. I love the blue colors on their faces. This one flew by and I took a few quick shots. Only after I looked at the photos on the computer did I realize that I’d caught him with a mid-air poop! The Ibises weren’t the only ones taking to the skies. 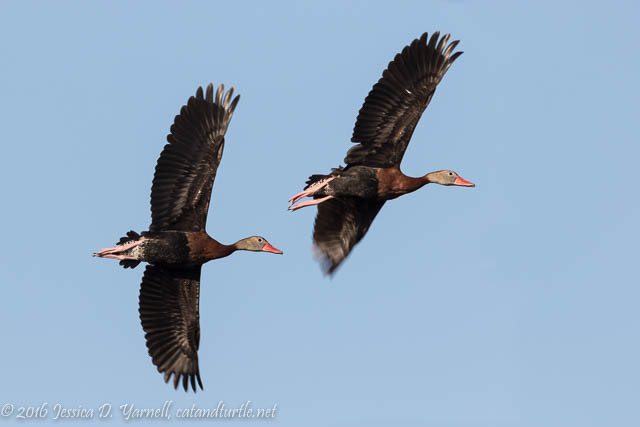 A couple of flocks of Black-bellied Whistling Ducks flew overhead. I have missed the sound of their happy calls! Common Gallinules are regulars in the waters alongside the berm roads. It’s that time of year when baby gallinules start making an appearance. 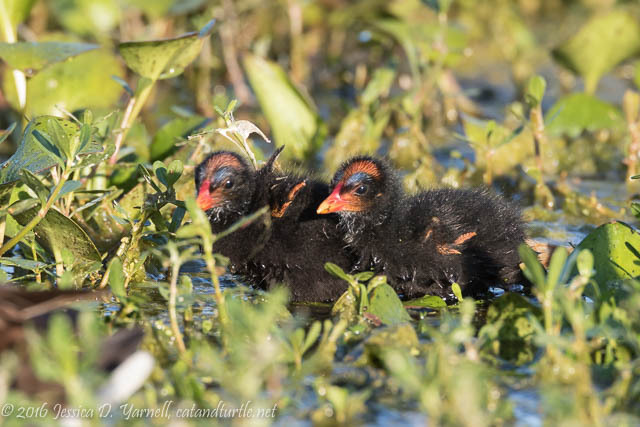 You may be wondering if these are baby aliens, but trust me, the ornithologists have clearly classified these little guys as Common Gallinules! 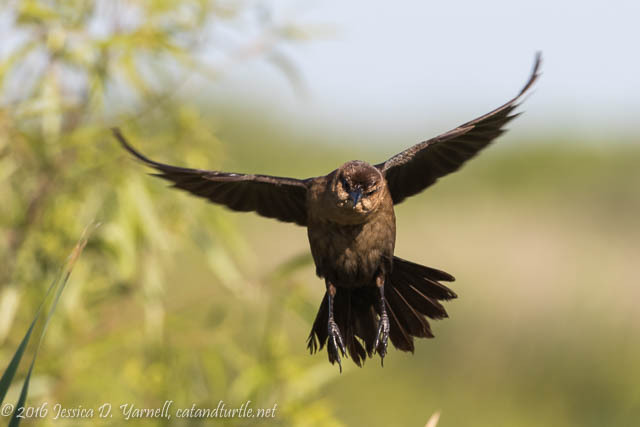 As I turned away from the lake shore, a female grackle caught my eye. She was poking repeatedly in some branches. 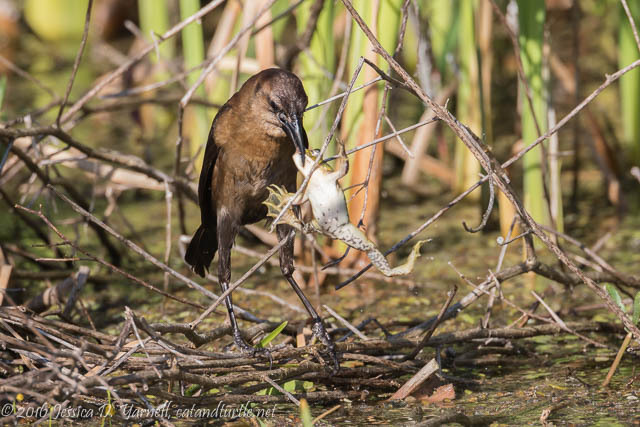 The next thing I knew, she picked up a frog and carried it off to feed her two young chicks! One chick was on the ground fluttering his wings and calling out insistently for food. He got the first few bites. Then she flew off with a mouthful, and that’s when I realized that she was also feeding the chick in the tree overhead! She continued to feed both for a few minutes until she caught the attention of other birds. That frog was too good not to share. I didn’t see who ultimately ended up with it! 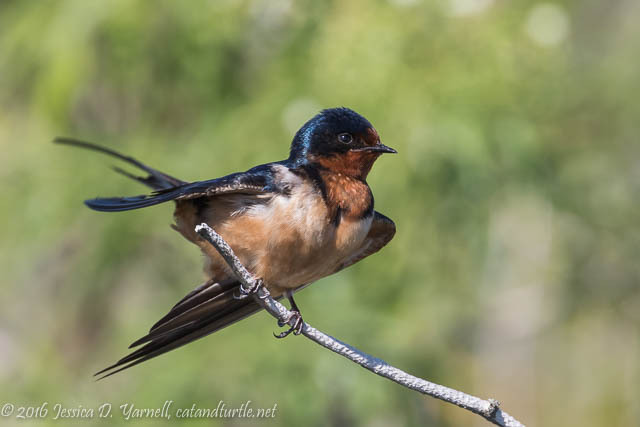 A small flock of Barn Swallows was my last good find of the day. They sat preening in a tree while I edged the car closer. They didn’t mind the click of my camera at all! Swallows are pretty and it’s hard to find them sitting still. A great end to a beautiful morning!